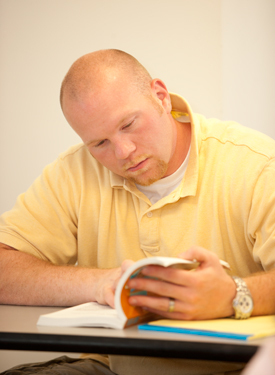 Misericordia University's Adult Education programs recognize the special needs of the adult learner. Classes are available to the adult learner during the early morning, day, late afternoon, evening, online, or weekends. Additionally, as an official CLEP (College Level Examination Program) testing site, Misericordia's acceptance of Prior Learning Assessment credits, and its transfer policy and articulation agreement with area community colleges helps students transfer and quickly attain credits towards their undergraduate degree. The following undergraduate majors and programs are available in the accelerated evening, online, and/or weekend formats. These and other majors may also be offered in the traditional, full-time format. For more information on part-time undergraduate programs, contact the Admissions Office at (570) 674-6791 or admissmu@misericordia.edu. The curriculum of the Accounting major provides individuals with communication, critical thinking, analytical skills, and the technical proficiency need to become professional accountants. Recognizing the ever-changing composition of the work force, the Business Administration program prepares students to recognize global changes and the ability to adapt to future needs. The Business Administration Major with a sequence allows students to focus on areas such as management, marketing, management information systems, or health care management to fashion their study to meet their professional and personal needs. The curriculum contains sufficient flexibility to meet most needs and expectations of the students, both those who intend to go on to graduate school and those who seek immediate entrance into the profession. The Health Care Management major is designed for the early to mid-career business professionals or health care clinicians interested in changing or advancing their careers. Students in the program will learn management skills, leadership development and specific areas if health care finance and reimbursement, marketing, health care law, and strategic planning form faculty who are senior managers in health care and experts in their field. The Information Technology Degree with a specialization in MIS constitutes an interdisciplinary approach to modern information systems, providing strong foundations in business and computer science as they relate to business information management, development and operations. The Information Technology program has also proven to be a viable second degree for many adults wishing to change career paths. The Professional Studies program allows adult students with previous college credits in career or technically-oriented programs to earn a bachelor's degree through additional studies. Individual programs of study are designed by the student with the assistance of the program director. The Sport Management major at Misericordia University allows students to combine their love of sport with the skills necessary to become professionals in the field. A business-oriented curriculum has been devised to produce graduates who will be successful in today's sports management environment as well as prepared for its future. The major allows students to fashion their studies to meet their professional and personal needs. Our curriculum prepares students for careers in this fast growing multi-billion dollar industry. The Addictions Counseling Certificate is designed to prepare graduates to work with the myriad of problems associated with chemical addictions. The Addictions Counseling program requires completion of a total of 16 credits in addictions coursework. Misericordia University offers a 9 credit, 3 course sequence, in Autism Spectrum Disorders (ASD). Students who successfully complete the program are eligible to sit for a Board Credential through IBCCES as a Certified Autism Specialist or an Autism Certification. Misericordia University’s 18-month certificate program in Diagnostic Medical Sonography (DMS), sometimes referred to as “ultrasound,” prepares students to become a diagnostic medical sonographer (SOC code 29-2032.00). The program is designed for adult or non-traditional learners seeking convenient and predictable scheduling by offering alternating weekend classes and a weekday clinical education component. Classes enter in late August each year. The part-time Diagnostic Medical Sonography Bachelor Degree is designed as a continuation of education for practicing sonographers whose personal and professional goal is to attain a degree and/or advance in their career. Given the complexity of the profession with credentialing in multiple specialties, this degree offers the opportunity to become knowledgeable in additional specialties, social sciences and/or leadership skills. The Bachelor of Science in Health Science with a Specialization in Exercise Science is designed to prepare students for entry-level employment in the health/fitness/wellness field, or continue formal education in schools offering advanced degrees in health-related graduate programs. The Misericordia University College of Health Sciences offers a Bachelor of Science in Health Science with a Medical Specialization as one option for students who intended to seek entry into graduate programs in the health professions. In particular, this degree should prepare students for entry into many Physician Assistant programs, including the Misericordia University Master of Science in Physician Assistant Studies graduate program. Upon completion of this degree, graduates will be adequately prepared to achieve their maximum potential as able, caring, compassionate, and competent pre-professionals. Professionals in the emerging field of patient advocacy, health education, wellness and community health collaborate with patients and clinicians to improve health outcomes. They steer patients successfully through the complex health care system and any subsequent treatment plans, while also possessing the skills necessary to safely and effectively follow patients across the care continuum. The Bachelor of Science in Health Science with a Patient Navigation Specialization prepares professionals who understand the barriers to effective care, such as poverty, insurance communication and information barriers; maintain an understanding of current health care trends and issues, and guide patients, caregivers and family members through the prescribed course of treatment. Patient Navigation professionals work hand-in-glove with patients, clinicians and administrators to ensure efficient and effective care is delivered. The Bachelor of Health Science with a Specialization in Respiratory Therapy is designed as a completion program for students to augment their knowledge in the health/fitness/wellness field. The Bachelor of Health Science with a Specialization in Surgical Technology is designed as a completion program for students to augment their knowledge in the health/fitness/wellness field. Our second degree Nursing program option is designed for individuals who have completed a bachelor's degree in another discipline. The program focuses on courses and prerequisites essential to nursing, assuming core curriculum requirements have already been met. Classes are available in daytime formats or our part-time, accelerated evening program for non-nurses. The RN to BSN online* program is designed for registered nurses who seek career advancement in their field, but do not wish to undertake the rigors and corresponding time and expense of a full-time schedule. The Patient Navigation Certificate is an 18 credit focus of study designed to augment current health care knowledge and provide specialized study in the area of patient advocacy, patient care process and health care navigation. Our nationally accredited Social Work program boasts an excellent reputation for preparing graduates with the knowledge, skills and value base that has been augmented by professional social work supervision in human service agencies. The Social Work major's focus on the "person in environment" paradigm uniquely prepares BSW graduates to work effectively with individuals, families, small groups, communities and organizations. The Social Work curriculum provides students with a professional foundation that is transferrable to different settings, population groups, and problem areas. The only accelerated BSW program of its kind in the region, this program affords adult students, who oftentimes have to work part- or full-time while completing their degrees, the flexibility they need to meet the demands of work, school and family. The predictable format of the program enables students to take classes at an affordable rate, while utilizing a blend of online and in-person delivery formats. The Biochemistry major at Misericordia University reflects the fusion of both the fields of Biology and Chemistry in a hybrid of each department's curricula. Our program is designed not only to prepare students for graduate school and careers in the pharmaceutical and biomedical industry, but also for professional studies in medicine, veterinary medicine, and related health sciences. Biology, the scientific study of living organisms, occurs at multiple levels spanning from the ecosystem down to the molecular level. The biology curriculum at Misericordia University is designed to provide a diverse and solid background in various areas of the biological sciences. The biology department consists of faculty whose fields of specialization include marine biology, plant pathology, entomology, physiology, animal behavior, and molecular and cellular biology. The Misericordia Department of Chemistry and Biochemistry strives to engage students in teaching and research activities from the moment they arrive on campus. Recent graduates have experienced success in moving onto Ph.D. programs in the biomedical sciences and chemistry related programs, teaching positions, professional school, and a range of industrial positions. We take pride in our small class sizes and strong faculty-student interaction in the classroom and in research projects. With all of its programs, the Teacher Education Department seeks to develop effective teachers who are masters of the content they teach and who teach in pedagogically-sound ways that inspire students to learn. Using educational theory and methods courses with the liberal arts core as a base, the Teacher Education Department provides a variety of learning opportunities to facilitate our students’ mastery of a thorough knowledge of human growth and development with an appreciation of diversity so that, as teachers, our graduates will understand, respect and respond to the unique strengths, needs, and desires presented by individual students and their families. The Program in Government, Law and National Security (GLNS) at Misericordia University is designed to prepare students to enter the expanding national security workforce within both the government and the private sector. Students will achieve an integrated knowledge of political science, legal studies, behavioral science, management, history and national security studies focused on the deterrence, detection, and mitigation of domestic and international threats to the public safety. Following a major course of study in history provides a student with a strong liberal arts background. The study of history can broaden a student’s perspective on local, national, and international issues. It fosters an understanding of the complexity of human motivation and action, providing a critical approach to looking at the past. The history program cultivates the ability to think, write, and speak clearly with thoroughness and independence. The Mass Communications and Design major prepares students for careers in such areas as advertising, public relations, journalism (print, broadcast, and electronic), video and audio production, graphic design, social media management, and writing for print and electronic media. Emphasis is on developing good writing and speaking skills, acquiring professional-level experience across several media platforms, and nurturing aesthetic awareness and creativity. The study of Mathematics is a balancing act between application and theory. Mathematicians enjoy pattern seeking, conjecture making, and articulate arguments, and we want our graduates to go into the world motivated by curiosity and armed with the skills that are hallmarks of mathematicians. Our curriculum is structured to encourage students to take a variety of courses. During their first two years, students complete 12 credits of Calculus, along with courses in Linear Algebra, Differential Equations, and Set Theory and Logic. After the students have a strong foundation in the fundamentals of Mathematical Theory, they have the option to take course from topics ranging from Abstract Algebra, Real and Complex Analysis (appropriate for students interested in Graduate School) to Statistics and Actuarial Sciences (appropriate for students interested in a career in industry). With the availability of directed readings and independent studies, students have the ability to customize their mathematical studies to suit their personal interests. Medical and Health Humanities is a growing field of interdisciplinary and interprofessional collaboration that focuses on the human, human experience, and human dignity as related to medicine and healthcare. Misericordia’s B.A. in Medical and Health Humanities integrates intellectually-rigorous courses with fieldwork experience that will comprehensively prepare students for future employment and a life of serving others with respect, compassion, and empathy. As a collaboration of academic disciplines in the Humanities, Health Sciences, and Sciences, the program offers a broad educational experience that challenges students to view healthcare through the lens of cultural, familial, philosophical, spiritual, mental, and social conditions. Additionally, at 41 credits, the curriculum’s flexibility allows students to pursue a second major, minor, or certification in complementary programs. This program presents Philosophy as an integral life activity growing out of a deep and passionate concern with life and its meaning. In its academic mode, Philosophy has been noted for cultivating those dispositions and aptitudes requisite for critical thinking and sound judgment. In this function it provides the strongest preparation for rational living. Our department is small, and the atmosphere is friendly. We enjoy what we do and our students receive quality advising and close personal attention. Quite often the discussions begun in class continue on down the hall with other faculty and students joining in the debate. We are careful to cultivate and maintain this casual environment of open discussion and we are quite proud of it. The Psychology Department at Misericordia is committed to excellence in undergraduate education in psychology. We seek to develop students that have the knowledge and skills essential for graduate study and/or post-graduate employment. Affirming the importance of experiential learning, we offer opportunities for student research, service learning, practica (internships), and extracurricular activities related to psychology. Our faculty are dedicated teachers and mentors, and we develop close relationships with students, both in and out of the classroom. Rapid advances in technology and the growing reliance on quantitative research have broadened the application of statistical reasoning to virtually all walks of life. Statistical techniques are widely used in research, industry, manufacturing, commerce, and government. The BS in Statistics program provides training in contemporary statistical techniques, as well as their theoretical background. By way of the Statistics elective courses, the program can be tailored to lead you to a wide variety of career choices in business or industry, or to prepare you for further studies in graduate school. Also, students who complete the BS in Statistics will automatically fulfill the necessary requirements for the Mathematics minor.